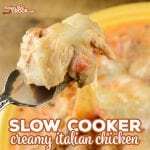 Slow Cooker Creamy Italian Chicken is a quick and easy crock pot recipe is a great all-day slow cooker recipe that tastes amazing! 2 Cups Marinara Sauce We like this low carb version. Place thighs in a 6-7 quart slow cooker. Top evenly with artichokes, peppers, olives and marinara sauce. Cook on low for 5-7 hours. Stir in cream cheese until melted. Serve as is, over noodles or zoodles and top with mozzarella cheese. We used our 7 quart Cuisinart Multicooker to cook this up, but any traditional 6 quart slow cooker or the casserole crock would cook this dish up nicely. We like this spiralizer to make our zoodles for dishes like this. We like to use this low carb marinara sauce in our tomato based dishes to keep carb counts down, but your favorite marinara sauce will work just fine. You can use chicken breasts instead of thighs for this dish, just make sure not to overcook. As with any of our recipes, calorie counts and nutritional information varies greatly depending on which products you choose to use when cooking this dish.